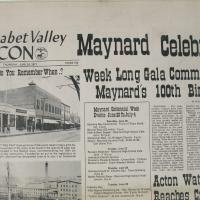 A collection of five weekly newspapers that featured the Maynard Centennial. 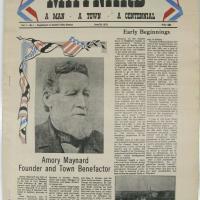 A supplement to the Assabet Valley Beacon newspaper at the time of Maynard's Centennial, 1971. The paper reviews the history of the town, including photos and a list of events. 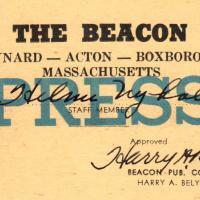 A press card issued to Helmi Nyholm by the Beacon, Harry A. Belyea, Mg. Ed. A copy of the Middlesex Recorder dated April 19, 1775. This was published occasionally in Acton. 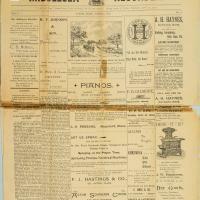 A souvenir copy of the Maynard Enterprise dated May 10, 1900. 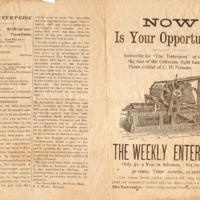 This was distributed at an exhibition during Merchants Week May 14, 1900, and was designed to promote the subscription to the Maynard Enterprise. Microfilm archive (1 roll) of the Stow Weekly Sun newspaper for the Mar 16, 1932 and Apr 27, 1932 issues. Microfilm archive (2 rolls) of the Bedford Enterprise newspaper. Microfilm archive (2 rolls) of the Acton Enterprise newspaper. Microfilm archive (2 rolls) of the Sudbury Enterprise newspaper. Microfilm archive (15 rolls) of The Maynard News spanning issues from June 2, 1899 - September 9, 1943. Note: not all years are present (e.g., no 1908). 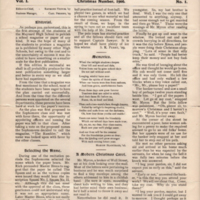 "As perhaps you understand, this is the first attempt of the students of the Maynard High School to publish a school magazine or paper of any kind." 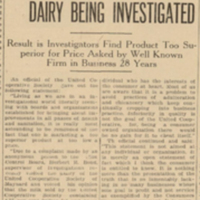 An article appearing in the Maynard Enterprise of July 24, 1935 on the results of an investigation of milk pricing by the United Cooperative Society.